After eight years of speeches at conferences, I’ve observed that while medicine achieves incredible miracles that were impossible a generation ago – like saving my sorry life – it still falls short of potential more often than necessary. Lots of people write big fat books about it, but some problems don’t change, which raises the question: what can we tell consumers of the system, patients, that will help them get the best care when they’re in need? So that’s a new series of speeches I’ll be doing, not just at big conferences but at local meetings in cities and towns, hospitals and community centers. These talks aren’t designed to change the healthcare system much; to the contrary, they’ll empower ordinary people who use the system to help the system do its best. This week I’ve had two new blog posts published on other blogs. This one’s close to my heart. 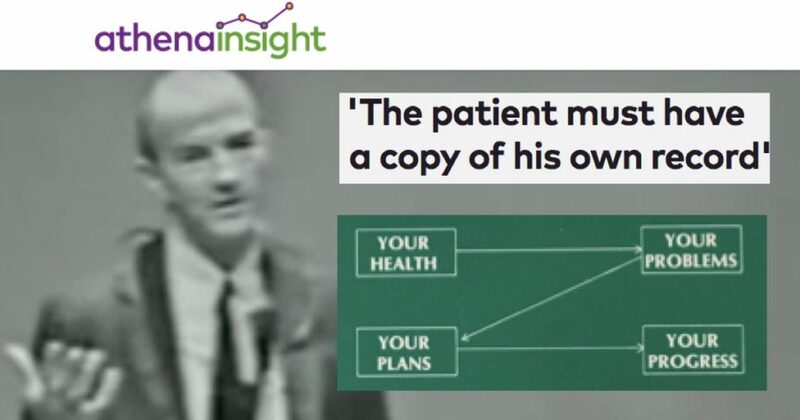 Dr. Larry Weed, who died in June, was a legendary physician, way way WAY ahead of his time in his vision for computers in healthcare, but also for his clear vision that if it’s your health, you need to be actively involved in managing it. AthenaHealth, a medical records system vendor, commissioned me to write a post about him, and it went live yesterday. I had found a copy of his amazing 1975 book Your Health Care and How To Manage It, and found some astounding things in it. Please go read the post and see the quotes. Several of you have commented that I started a series this spring on the evolution of my business and my advocacy over the past eight years, and then it stopped. Well, it hasn’t stopped, but the work itself has collided with the reporting about it. 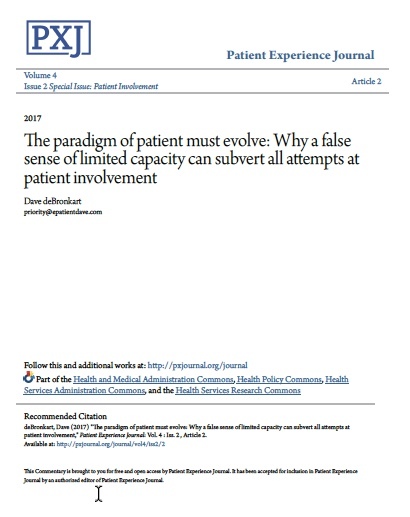 I have a new essay, just published today, in Patient Experience Journal, which brings together a ton of interwoven issues I’ve been reading and thinking about: The paradigm of patient must evolve: Why a false sense of limited capacity can subvert all attempts at patient involvement. 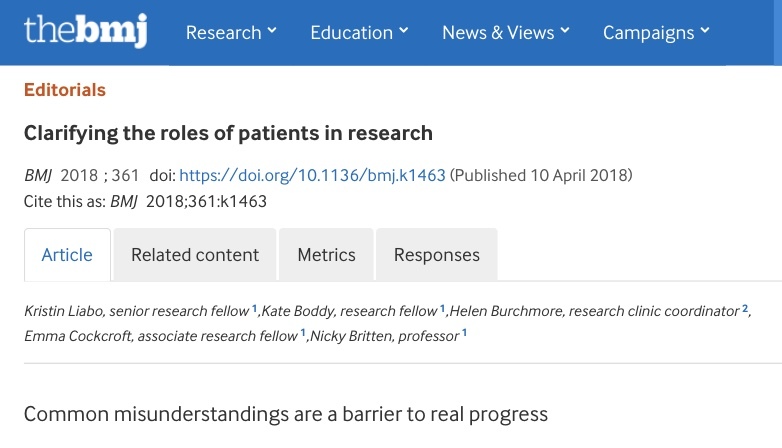 It’s in that journal’s first Special Issue, devoted to patient involvement in producing healthcare. 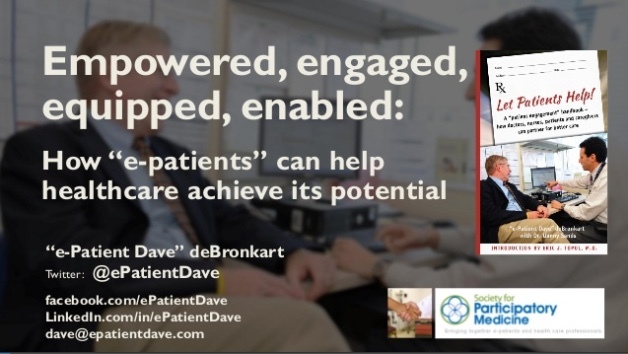 Video: What do empowered and engaged really mean? Some moments stick in your memory in vivid, multi-sensory recall. This blog post is dated ten years after such a moment. Today I can still see the clock digits on my Sony desk phone when it rang at precisely 9:00 a.m. It was my primary care physician, Dr. Danny Sands. 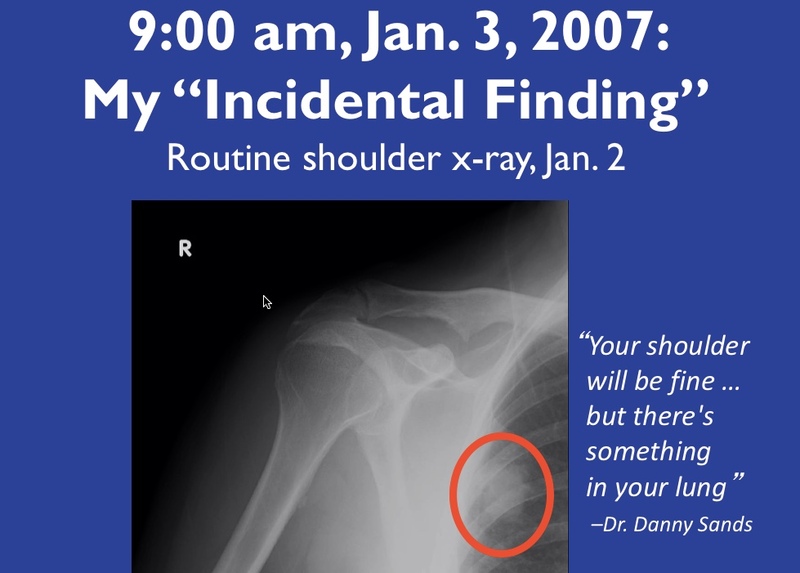 I’d had my annual physical on 12/29, and as a follow-up for a stiff shoulder, on January 2 I’d had an x-ray from one of the Boston Red Sox team physicians. Patients around the world have told me they can relate to what happened when I answered the phone: what Dr. Sands said changed my life in an instant. Dave, your shoulder’s going to be fine – it’s just a rotator cuff problem. But there’s something in your lung, and we need to find out what it is.